Fast 4.8 lines per second, two-color ribbon printer. 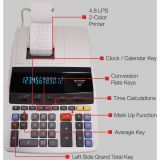 Sharp EL2630PIII Two-Color Printing Calculator, Black/Red Print, 4.8 Lines/Sec - Heavy-duty, printing calculator prints 4.8 lines per second in two colors. Your printouts will feature positive numbers in black and negative numbers in red on standard-size paper rolls. 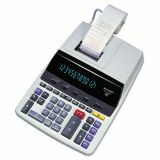 For easy viewing, the extra-large, blue fluorescent display features 12 digits (17.0 mm) with punctuation. 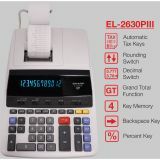 Grand Total Key adds the grand total of several calculations such as the total prices x units on an invoice. Use the Average Key to find the mean" or average. Mark-Up Key performs mark-ups, cost/sell/margin calculations, percent changes, and automatic add-on/discounts. Calendar/clock function displays and prints date and time. The 4-key memory includes memory plus, memory minus, recall and clear memory keys. 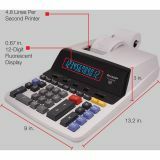 The deluxe commercial-quality calculator also includes floating (F) or fixed decimal (6-3-2-1-0), add (A) and constant (K) modes, item count, and round up/down/off selector. 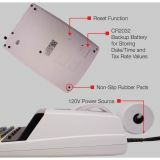 The calculator operates on AC power."